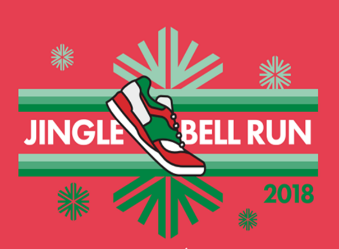 For all participants, registration includes long sleeve t-shirt, finisher medal, jingle bells, bib (chipped for runners, unchipped for walkers), hot coco, coffee, snacks, meet and greet with Santa and endless fun! Long sleeved shirt, timing chip, express packet pick up, access to the VIP Tent, gear check, finisher medal, a swag bag and more! Can I use a discount code on their Express Pass registration? TEAMS: Any team that raises $1,500+ will earn a team table in the VIP tent, decked out with goodies! All team members will also have access to gear check and will receive a swag bag. Do I need to be a good runner to do this? Nope. We welcome both the serious runner (medals are given for categories below) to the anyone who just wants to have fun (finisher medals are given to all). Run or walk however you would like. View the race route, HERE. This event will be held rain or shine except in the case of severe weather (i.e. thunder, snow storm, hail, ice). The safety of our participants and vendors is our utmost priority: in the event of cancellation, all registered participants will be emailed and all team captains will be called. Also check our Facebook pages, @ArthritisPennsylvania, Jingle Bell Run Philadelphia and Jingle Bell Run Chester County. No refunds will be given due to inclement weather. Can be found on the @ArthritisPennsylvania Facebook page. Lost items that were found and turned in will be returned to Arthritis Foundation office after the event. Please email sarasmith@arthritis.org or call 267-332-1692. Let us know! Email sarasmith@arthritis.org or call 267-332-1692.